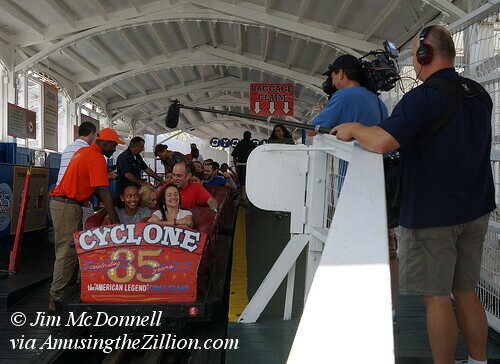 Last weekend a crew from Indigo Films was in Coney Island on a two-day shoot for an upcoming Travel Channel series. The new show is tentatively titled “Amazing Boardwalk Empires.” They filmed Coney Island’s 22nd Annual Sand Sculpting Contest and some of the features of the boardwalk as well as Luna Park and Scream Zone, the Cyclone, Deno’s Wonder Wheel Park, the Coney Island History Project, the Coney Island Sideshow and Lola Star Boutique. Coney Island was selected for the show because the Riegelmann Boardwalk is among the top beach boardwalks in the country on lists as various as National Geographic, Travel & Leisure and USA Today. 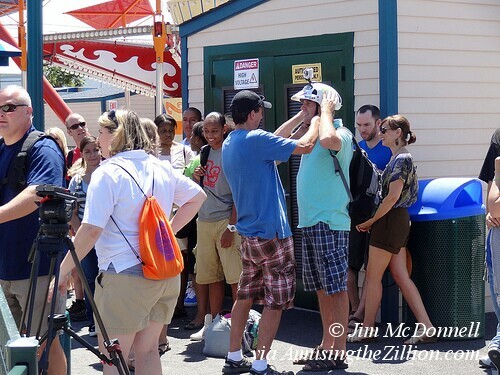 In the photo above, one of the extras is being mounted with a GoPro helmet cam to ride Zamperla’s Air Race, according to photographer Jim McDonnell. The HD camera is used a lot in shooting sports and POV videos. In the photo below, taken inside the Coney Island History Project exhibit center, Amanda Deutch is being interviewed about the history of Coney’s Boardwalk, where she leads walking tours for the History Project. Indigo Films is an award-winning independent television production company that has produced such Travel Channel shows as Insane Coaster Wars and America’s Most Haunted Places. The Travel Channel series on Boardwalks is expected to air in September.